Community Relations Programming – Clann Eireann Youth Club, Lurgan Youth Annexe, Donnycarney Youth Project. Celebration Night Craigavon Civic Centre Wed 5th March 2014. Wednesday 5th March saw a fitting end to what can only be described as a very enjoyable and successful series of community relations programmes which have been developed between Clann Eireann Youth Club, Lurgan Youth Annexe and Donnycarney Youth Project over the past twelve months. 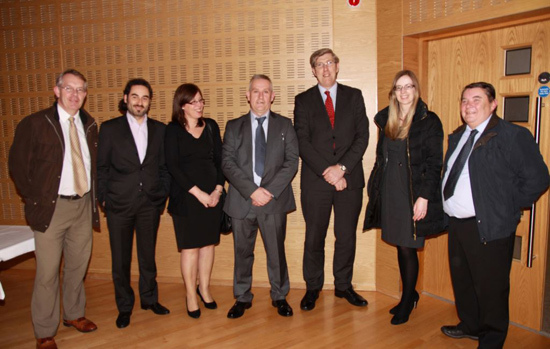 All projects came to a conclusion with a Celebration Night at the Mayes Hall Civic Centre Craigavon on Wednesday 5th March 2014. The evening saw sixty young people and their respective project workers join upwards of one hundred invited guests including parents and representatives from all the local statutory agencies and political parties. Invited Guests for the evening were greeted by Mr Colin Mc Cusker Deputy Mayor of Craigavon as well as Ms Orlaith Fitzmaurice Department Director of Peace and Reconciliation Fund DFA Dublin -the programmes main sponsor, Minister for Education Mr John O Dowd MLA was also in attendance as was our guest speaker for the evening Mr Alan Mc Bride WAVE. All contributions from all speakers on the night congratulated the young people on their achievements and highlighted the need for more community relations programmes. An edited version of a DVD which was shown on the night the full version formally launched by Orlaith Fitzmaurice from DFA (Dublin) , this gave those in attendance an insight into the tremendous work which had been undertaken in Single Identity Programmes, local contact and cross border programmes. To develop further and enhance the community relations engagements already undertaken by Clann Eireann (North Lurgan )and Lurgan Youth Annexe ( South Lurgan ) both Lurgan groups in partnership with Donnycarney Youth Group (North Dublin )initiated new programming to deliver a north- south cross border dimension to our work . Apprentice Boys Hall Derry/Londonderry , Free Derry Museum , Farset Centre Belfast , Craigavon Golf and Ski Centre, St Columb,s Cathedral, Londonderry, Tour of Derry’s Walls , Mural Tour Bogside , Mural Tour Shankill Rd Belfast , Mural Tour Falls Rd Belfast , Millennium Theatre Derry , Gate Theatre Dublin , Belfast City Hall , The New Assembly at Stormont , Titanic Exhibition Belfast, Crumlin Rd Gaol, Odyssey Centre Belfast, Todd’s Leap Activity Centre Ballygawley, Kart City Dublin Guild Hall Derry , Peace Bridge Derry, Titanic Memorial Belfast City Hall, The Cavan Centre -Outdoor Education Ballyjamesduff . Events undertaken as part of a Dublin Residential weekend included trips to SkyTour Croke Park , St Patricks Cathedral Dublin , Collins Barracks , Island bridge National War Memorial , The Axis Theatre Ballymun , Glasnevin Cemetery Dublin , 1914 Dublin Lockout Exhibition Nat Library Dublin as part of Centenary of Commemorations. Alan Mc Bride was invited as our guest speaker and encouraged the young people for their willingness to engage with one another in a respectful way and to celebrate difference and diversity reminding us all of our shared history and touching on his personal story in growing up with and as a victim/survivor of our troubled past . The importance of programmes such as this should not be under estimated as making positive interventions leading to greater understanding, education and the development of a shared future. Minister O’Dowd was kind enough to formally congratulate the group and presented those in attendance with Programme Certificates. It was evident from speaking to parents’ who attended that there is a strong community support for programmes which deal with issues on sectarianism and prejudice. The project staff would wish to thank all of those involved in the projects not least the young people themselves and there respective parents’. It is hoped that both Clann Eireann Youth Club, Lurgan Youth Annexe and Donnycarney Youth Project will further assist young people from all communities, all traditions and identities to engage with one another in a positive way building positive relationships . 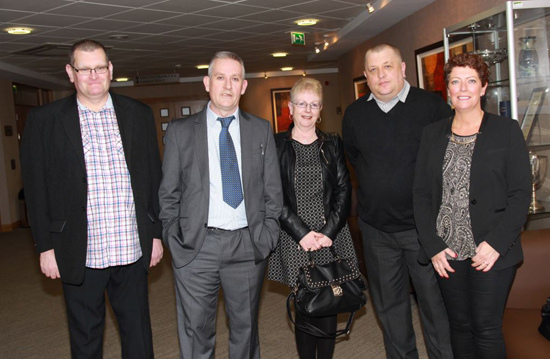 We would wish to acknowledge the assistance and support of all of the staff at Craigavon Civic Centre and those within the councils own Community Relations Department .The evening concluded with a three course meal which was enjoyed by everyone. Many thanks to all of the staff teams, young people and communities involved. Special thanks also to all of the respective parents for their on-going and continuous support. This programme is funded by The Department of Foreign Affairs and Trade Dublin as part of their Anti Sectarianism and Peace and Reconciliation Programme. We would also wish to acknowledge the support of The SELB Youth Service.